The Half Square Pose is a milder version of the Square Pose, but still a lovely hip-opener! If you have tight hips, this is the perfect modification for you! In order to understand the full expression of the Square Pose, please see this article first! Even if you have really tight hips, the Half Square Pose is every bit as therapeutic as the full Square Pose, yet will be much more comfortable for you to practice. To set up the pose, start in a sitting position, with your legs extended out in front of you. Cross your right ankle over your left knee as shown in the 1st picture below. I like to rest my right hand on my knee, as shown, to provide a gentle pressure to help my right hip settle into this pose. Once you have grounded your sitting bones, and are settled into the starting position, release your back by rounding it, and start to fold forward as shown in the picture below. Hold the pose for 3-5 minutes. Come to only a mild edge to begin. 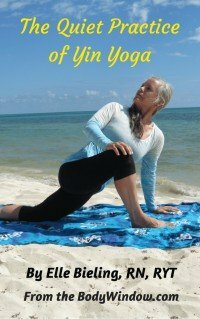 You may want to place a yoga bolster between your bent knee and your torso, to help you release your upper body and back into full relaxation. If the forward bend feels unsafe for your back, you may try raising your hips up on a blanket, to help tilt your hips forward. If this doesn't relieve your back issue, keep your torso upright, or even sit up against a wall, to support your lower back. If you use a wall, snuggle your hips as close to the wall as you can. As with the Square Pose, practice the mindfulness of conscious breathing while you hold this pose. Please see my article on the full pose, for more information on the therapeutic value of the Square Pose. The primary effect of this pose is for opening and balancing your 2nd Chakra issues. As you stay silent, still and aware in the pose, you may notice that your hip releases and you are able to lower your upper body farther. This is a wonderful feeling of opening, that is often accompanied by "seeing" emotions that you may or may not have been aware of. Just notice and accept these emotions. Allow them to express themselves, being mindful that this is a therapeutic process for you! Hip openers are able to help you uncover deeply held emotional issues that you may not be aware you have. The mindfulness practice of long-held poses that work deep into the hips, helps you become more open and aware of these issues. That which you do to your body, you also do to your soul! After you complete the pose on the right side, don't forget to do the left side for an equal amount of time to stay balanced! May you find the intense hip opener of the Half Square Pose to be therapeutic for any 2nd Chakra issues that you may have! May you use your body as a window to your soul for complete healing!